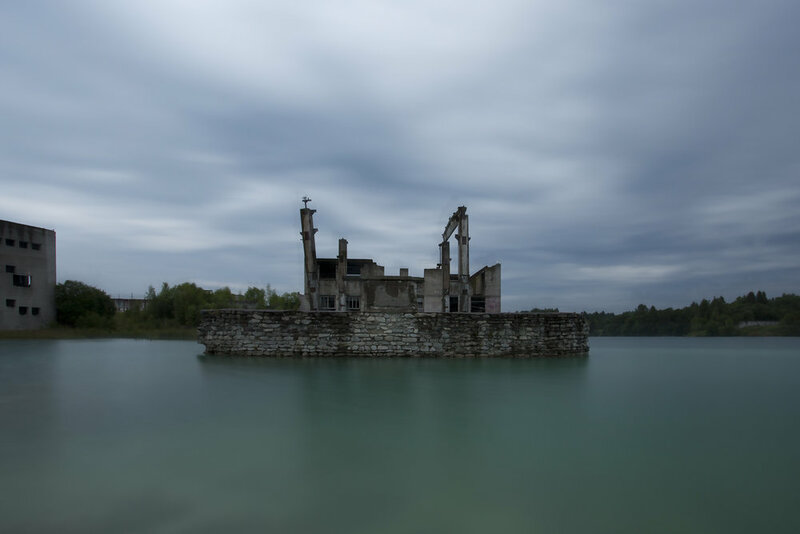 Only for the past couple of years, Rummu has been favoured by scuba divers because the lake floor is covered with buildings, walls, and mining machinery. When I dived in Rummu for the first time, the place was unknown to many divers back in Finland. It is weird because Rummu isn’t actually so far from Helsinki, only about a hundred kilometers. We visited Rummu three times in the past six months and witnessed the Rummu lake bathing both in sunlight and in ice. The prison of Rummu is located in Rummu (surprise) in Estonia. The original name of the prison is Murru and the name Rummu is affiliated with the area which is much larger that the actual prison area. The prison camp was founded just before the Second World War in 1938. The image of a prison with modern cells and cafeterias doesn’t quite add up because the prison resembles more like a labour camp than a regular prison like the Patarei prison for example. The reason for both the location and the moist fate of the prison lies in the booming mining industry of the time. The prisoners were the labour force of the camp and the prison employed over 400 prisoners for the mining. The largest buildings of the prison were constructed between the 1960s and 1980s. The first barracks were built from wood, the first actual prison cell was built in 1949. Just like in Skrunda, everything was made out of grey cheap brick and it covers both the structures beneath and above the waterline. Mining of sandstone and slate filled most of the days of the prisoners but there was also a vocational school in the prison area where tractor drivers and metalworkers were taught. The groundwater of Rummu quarry was pumped through a long ditch straight into a pond in the center of Rummu town and was again used in farming. The mining came to a halt when the Soviet Union collapsed and Estonia became independent right after. The demand for the mining products quickly decreased and with the new republic, the idea of using the prisoners as miners didn’t seem so ideal anymore. The groundwater pumps seized and the area was partially filled with water. This is why today scuba divers can find buildings and remains of the vocational school underwater. The area is divided by a long wall in which old lamps are still attached. Slowly the lamps have turned green, just like everything else in the quarry lake. The potholes of the dirt road were frozen. The road took us around the quarry lake, behind the huge sandstone hill. The sun was warming up the day and the winter had not gone so far that the quarry lake would have been frozen. Diving in open water was still possible, barely. Soon the lake would receive its icy blanket and diving would be much more difficult. We were planning to do only one dive this time because the water was freezing. Our small rental car was packed with both scuba and photography gear. We stopped next to the wall partially covered with barb wire. We put on our dry suits and assembled our underwater gear. Next we climbed from a little hole in the wall with full gear which warmed me up nicely for the icy water. There was some walking up ahead before we reached the waterline. 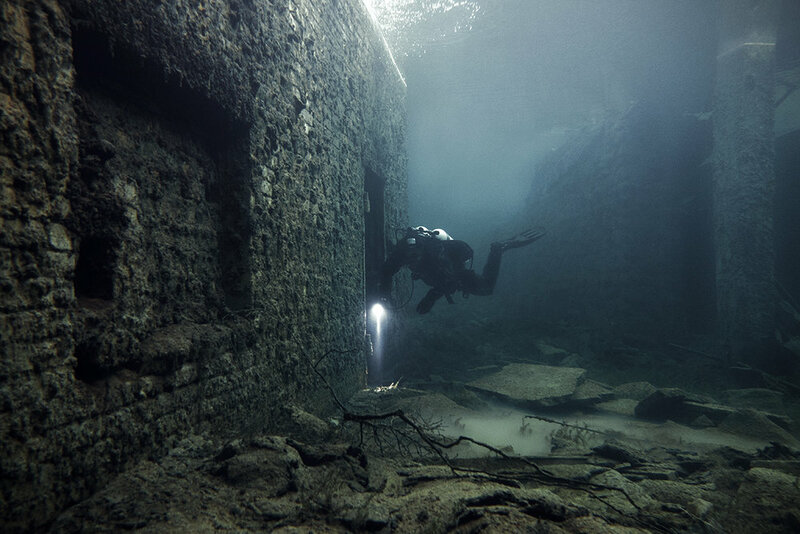 The gear started to feel pretty heavy but soon the water took the weight away and familiar weightlessness of scuba diving was the dominant feeling when we descended to the bottom of the quarry. The cold water shivered my lips. I could hear my own breathing through the regulator with a mechanical tone. In water, sound travels a lot faster but still, silence reigns. We circled the largest building underwater, some sections of this particular building were above the waterline. The visibility in the water was fair but rays of midday sunlight revealed the walls and the shapes of the buildings in front of us. We swam inside from a large doorway inside the basement of a building with a partially collapsed roof. Some of the rooms were completely underwater. The rooms were full of concrete and darkness. Bars are still intact in the windows. Even though the buildings are grey, the penetrating greenness of the water brought warmth to the scenery. Nature has taken over this world a long time ago. We continue our dive towards the next group of buildings. Large concrete elements have fallen over the building in front of us. The pillars are covered with green growth, some sort of thick mycelium is hanging everywhere. We enter a building swimming under one of the elements. Our eyes adjust to the darkness quickly. In the next room, rays of light are illuminating the scene from windows and a doorway. Our exhale bubbles hit the roof of the rooms trying to seek their way into surface. This dive is very shallow, my gauge is showing that we are only 6 meters deep, basically at the surface. From a narrow doorway we manage to squeeze inside the next room. The rooms are basically empty, no items are left. A single beer bottle is lying on the floor. We hover weightlessly from room to room. The peaceful state of mind is turning into coldness. The water is 4 degrees celsius. I am used to shivers when exploring the abandoned world but this time it is because I was actually freezing. The outlines of a wall is slowly forming into my retinas. Soon, I was hovering next to an old lamp which is still hanging from the wall. Years ago it lit the side of the wall but now it serves only as a reminder of the purpose of the place. Familiar growth is hanging from it and beneath I can see rolls of barbed wire. Tanja is circling around the wall taking pictures and effortlessly she points out where I have to move so we can take a proper photo. Underwater photography has its own set of rules. Photos are usually about scenes foreign to most of us and a figure of a diver helps the viewer understand the proportions in the picture. I inhale and ascend into the exact place where Tanja wants me to halt. After that, I can’t move a fin. I can see old wooden stairs below me as well as some handrailings, I turn just a degree or two. Tanja is adjusting the camera and I can see that it is getting harder and harder to take the shot. Her fingers are numb from the coldness. We had been under the surface for an hour circling around the walls, buildings and rooms inside them. Coldness had taken the sense from our fingers and toes. It didn’t take much stiff hand signaling to get to an agreement about ending the dive. In water, coldness reaches the diver much more quickly than in surface. Water conducts heat much more effectively, especially in the winter when water is near its freezing point. The world under the surface is mystical and beautiful but at some point, coldness fills the divers mind. It was time to head to the surface, to a much more dry photographing environment. An hour in a weightless space seems like a deception. The gear feels like lead. We took off the fins and headed to our car. It was the end of only one dive. Rummu is a special place especially for Tanja. I could see a faint smile from her blueish lips. The buildings rising from the green water form a bizarre sight. On a clear day, one can see the underwater structures, buildings and walls, easily from the sand hill next to the quarry lake. I’m not surprised why this place fascinates so many, including Tanja. Unfortunately, not much history remains from this odd place. Just like in Skrunda, documents of old photos are really hard to come by. I have never seen one photo from the active days of the Rummu prison camp. It seems like Rummu was born underwater, but still we can figure out that the place used to be very different. Again, pictures are formed differently for everyone, we can only rely on our imagination if we want to visit Soviet-era Rummu.